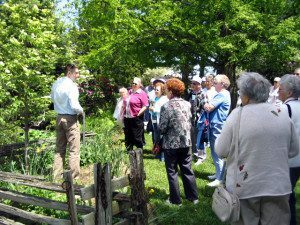 Goodell Gardens offers tours to large groups, with appointment, at a discounted rate. The group tour rate starts at $3 per person, and can include a guided tour, and reserved picnic tables for lunch. Group tours must be scheduled at least two weeks in advance, and can only occur during our regular operating hours, Wednesday - Sunday, 11 am to 5 pm. To schedule your group tour, please email info@goodellgardens.org, or call (814) 734-6699.